This is the second panel from a tetraptych. An acclaimed masterpiece of Osaka printmaking, its detailed landscape setting provides a grand panoramic of the kabuki play, Shibau suikoden Hyakuhachinin no uchi (108 Heroes of the Theatre Suikoden), performed in the 11th month of 1835 in Osaka. In this pristine example is Nakamura Utaemon III (1778-1838) as Ju-unryū Kōsonshō. Tales of the Chinese legendary “Suikoden” (water margin) outlaws and their adventures were easily adapted to exciting dramas for the kabuki stage. In this color woodcut Hokuei captured a particular performance, but other print artists (such as Kuniyoshi in this exhibition) simply illustrated the well-known stories from their own imaginations. Illustrated in 1) Ikeda Bunko, Kamigata yakusha-e shūsei (Collected Kamigata Actor Prints), vol. 2, Osaka, 1998, No. 341. 2) The full composition in color in Masterpieces of Japanese Prints: The European Collections - Ukiyo-e from the Victoria and Albert Museum II, Kodansha International, 1991, pp. 130-31. In color in 3) in 原色浮世絵大百科事典 (Genshoku Ukiyoe Daihyakka Jiten), vol. 9, pp. 124-125. 4) In a two page color fold-out in The Theatrical World of Osaka Prints by Roger Keyes and Keiko Mizushima, Philadelphia Museum of Art, text on page 146, 1973. 5) In color in Ukiyo-e to Shin hanga: The Art of Japanese Woodblock Prints, Mallard Press, 1990, p. 182. 6) In color in Ukiyo-e Masterpieces in European Collection 5: Victoria and Albert Museum II, Kodansha, 1989, #153. Willem van Gulik in his book Irezumi wrote extensively about this subject. "This phenomenon of protection afforded by (seemingly) opposing elements, has meanwhile become a recurrent and familiar theme. The relation of the elements water and metal, both opposed to fire, as expressed in the trinity dragon tattoo... [This] contrast-harmony of metal and water as symbolized by sword and dragon is perhaps most distinctively expressed by the so-called kurikara-ryō symbol, represented by a dragon coiled around a swordblade. The combination is said to be connected with the legend of the stormgod Susa-no-o killing the dragon in whose tail he finds the heavenly sword which he presents to his sister, the Sun-goddess Amaterasu. An allusion to this legendary episode may well be represented in fig. 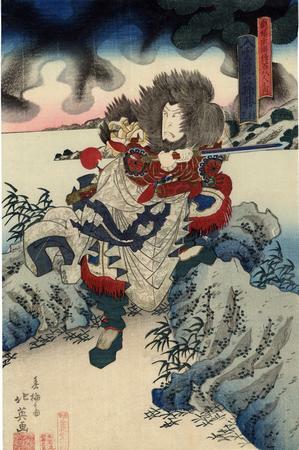 106, depicting the hero Ju-unryū Kōsonshō, from the famous Suikoden print series by Kuniyoshi. The kurikara-ryō is also said to be generally accepted as the symbolization of the union of the yin and yang principles. As such, it may serve as a protective and auspicious emblem, often met with as an ornamental design... The water (dragon) and metal (sword) are attracted to each other, may easily be explained in terms of their relation in the cycle of the five elements. In this cycle... metal and water stand in a position diametrically opposed to fire. Furthermore, they are closely related in that metal generates water in the mutual production order of the five elements. It is therefore quite natural that the metal-water combination may be so distinctly encountered in the kurikara-ryō representation."